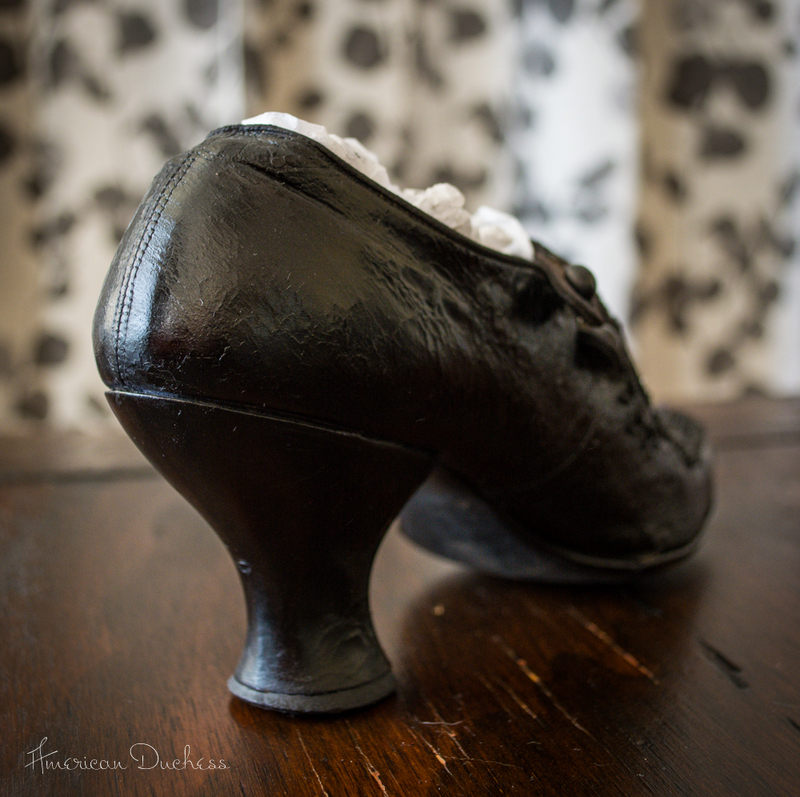 A little while ago, our wonderful customer Deb found an original "Astoria" shoe languishing in an antique shop. She asked if I'd like to have it, to which I enthusiastically responded, "absolutely!" The poor little thing was in such a state, with its leather cracked and flaking, its shape distorted by decades of neglect, and its sole leather worn and separating from the upper. This was a shoe that was used thoroughly in its working life, but history had ravaged it as well. With antique anything, the question(s) of conservation and preservation always come up. Some items need to be stabilized in their current condition, to prevent further deterioration. Other items need to be carefully cleaned and restored. Then there are items like this little original Astoria. Forgive me for not taking photos of it beforehand, but believe when I tell you it was derelict. I was actually surprised that the antique shop kept the shoe, as it was so worn that most people would simply throw it away. This shoe needed to be stabilized rather aggressively, and what I ended up doing was really "freezing it in time" after I restored it as much as I could. Thank goodness for Angelus products. I worked in Angelus Lustre Cream, a pigmented product that hydrates and conditions leather, followed by Angelus Shoe Wax Polish, which fills in cracks, covers scuffs, and coats the leather. A soft buff with my rag brought the leather back to some of its former glory, but the extensive cracking all over the upper was not stable and was still flaking off if looked at sideways. At this point I made the decision to carefully paint on Angelus Acrylic Finisher, which re-adhered the flakes and "froze" them, keeping the shoe together for a long time to come. Stuffing the shoe with paper (which will be replaced by an un-bleached muslin "pillow") was the final step. 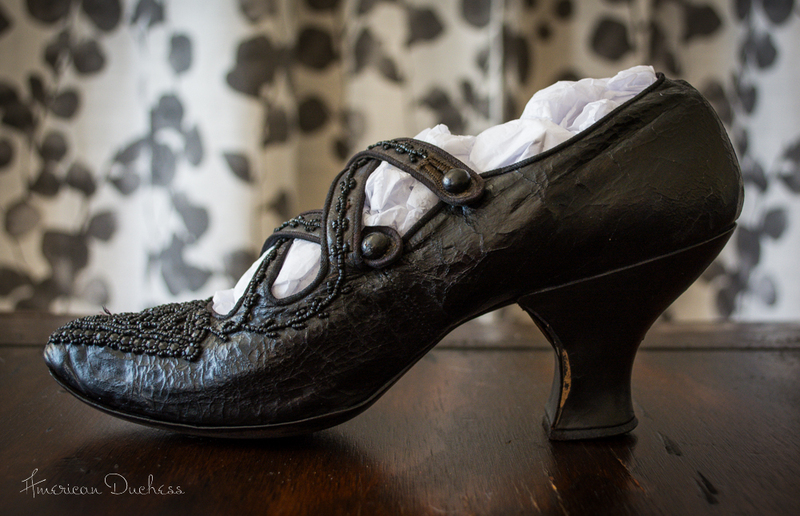 I know some of you will object to the way I restored this shoe, but knowing that leather literally just disintegrates on its own over time, I felt that this shoe, particularly as an example of a style American Duchess has reproduced, needed to be saved in any non-obtrusive way possible, and preserved for the future as not only a study object, but also an object of beauty. Those iconic straps, pointed toe, and all those beads - YUM! Love this style? 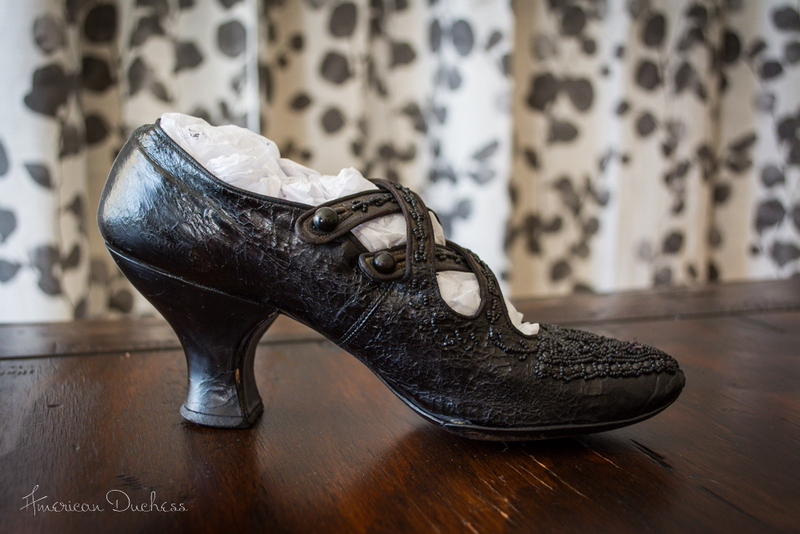 Check out our "Astoria" lattice-strapped Edwardian shoes in black or ivory - Click Here. Beautiful work! It's always fun to "heal" old heels. Angelus is fantastic stuff. I think you did a really good job. 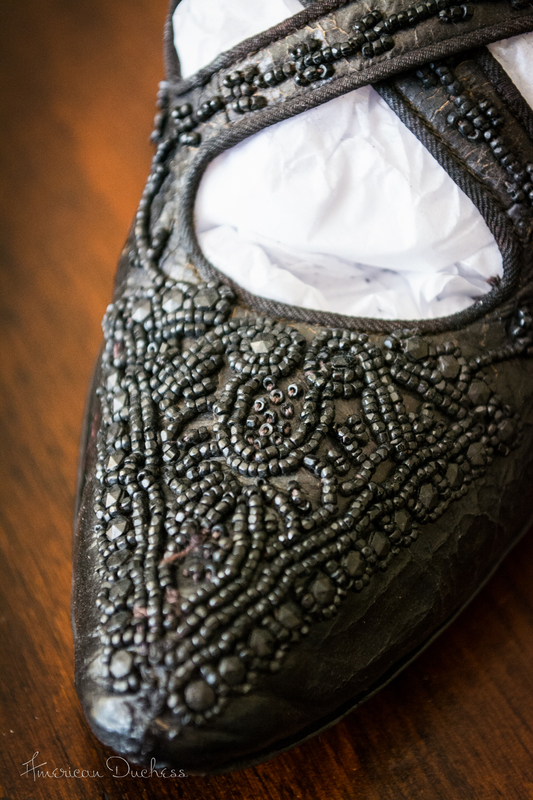 It's good for you to have an original in the style, and if the treatment's not fully reversible, well, there are a lot of shoes in museum collections that can be done by the book. When an object's totally coming apart, sometimes more drastic measures are needed. I think you did a wonderful job! It was doing no one any favors sitting in an antique shop, and now you have given it new life, to be enjoyed by so many! I have a question for you. I have a pair of shoes that belonged to my grandmother. She wore them at her wedding in 1922. I love them dearly, but they are deteriorating. They are an ivory colored silk. The buttons fell off years ago, before I got them. They have spent the last 90 years in my grandmother's trunk. Right now I have them in my china cabinet displayed with her wedding photo and the headdress from her veil. I want to keep them on display, because I believe it is important for them to be seen and loved. What should I do to keep them from deteriorating further, but allow them to remain on display? Hi Rooskie - That's a very good question. 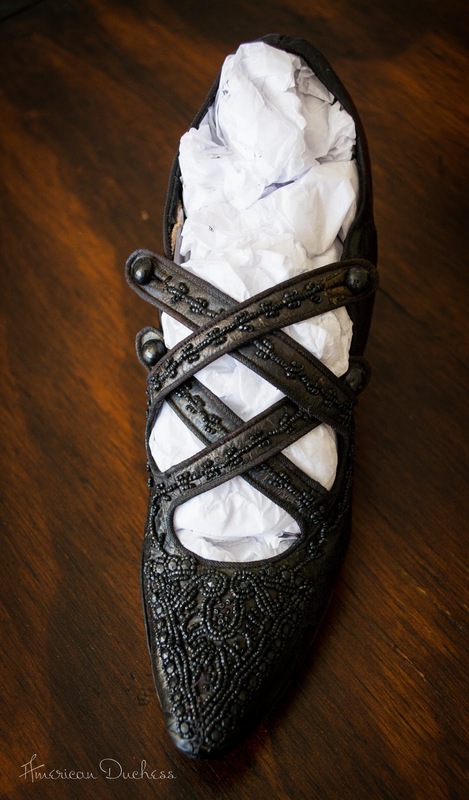 Leather shoes are fairly easy to restore and/or stabilize, but silk is a lot harder. I'm not sure there is anything you can do except make sure the shoes are stored away from light an dust, and that anything touching the fabric is acid-free (for instance, if you have them stuffed with something like newspaper, fabric, poly fill.) You might find some helpful information on this blog: http://nttextileconservationstudio.wordpress.com/ or possibly even write to the bloggers to ask for advice. I hope that helps!